This newspaper clipping shows the burning of the Covered Bridge over the Rivanna River at Palmyra in 1931. Although this was done by the Virginia State Highway Department under controlled conditions, it was still a sight to see. This bridge was originally built by Palmyra patron Walter Timberlake in 1828 and then sold to the state in 1847. It was burned by Union General Philip Sheridan during the Civil War in 1865, and rebuilt many several times after the storms carried the bridge downstream, but the covered bridge had seen its last day in 1931. The steel overhead truss Pembroke Pettit Bridge at Palmyra replaced the covered bridge at Palmyra. All rights reserved. Permission to reproduce any part of this item in any form or by any means must be obtained in writing from the Fluvanna County Historical Society. 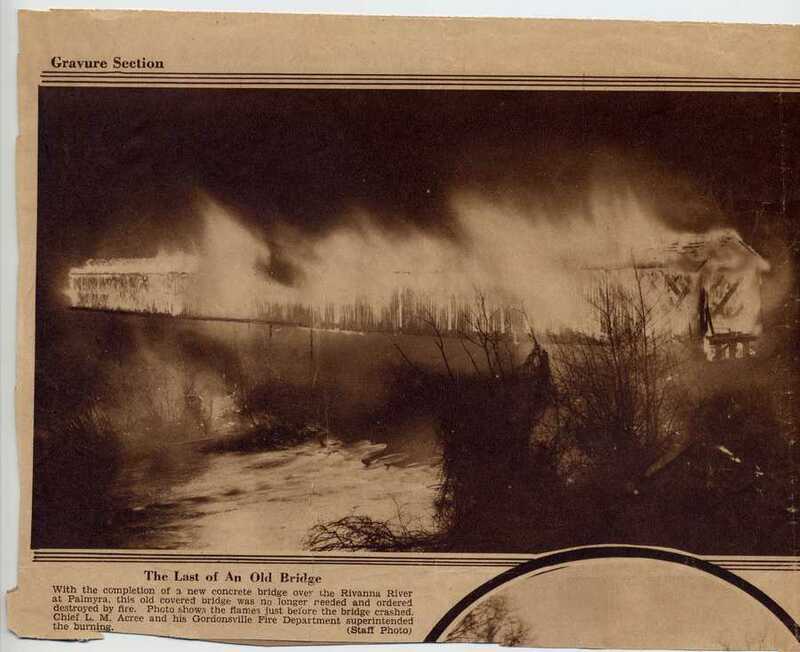 Fluvanna County Historical Society, “Burning of the Palmyra Covered Bridge,” Piedmont Virginia Digital History: The Land Between the Rivers , accessed April 23, 2019, http://www.piedmontvahistory.org/archives14/index.php/items/show/155.